I tried making a large quantity of homemade breakfast sausage once that resulted in very dry patties with not much flavor. I had baked the sausage, thinking that would help retain some moisture. It did not. There is an art to making good sausage that requires the right proportion of protein to fat. As well, the method of cooking sausage makes a difference in the flavor and moisture content. I prefer to buy pre-made sausage that has dried sufficiently before smoking it. Some of my favorites are sweet Italian, chicken with apples, and Merguez North African lamb sausage. If you want to take a crack at making your own sausage and putting it into casings, be mindful that it does need to dry and chill before you smoke it in your Masterbuilt Electric Smoker. Sausage that has not had time to dry out a bit will tend to steam and swell. There is potential for the casing to break and the fat to leak out. 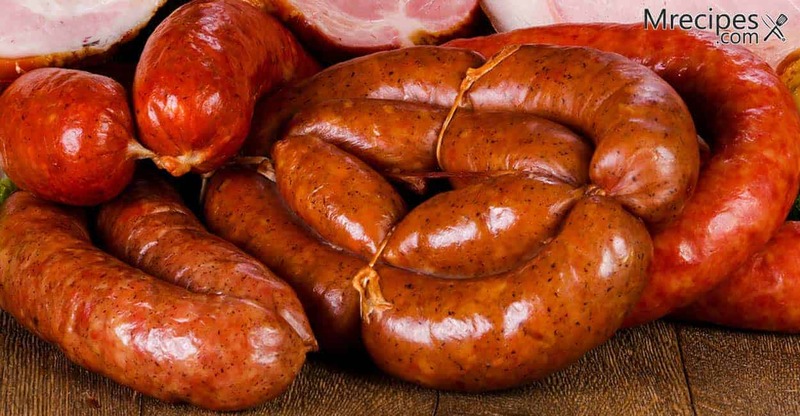 Some sausage aficionados are adamant that you add a curing agent to your meat mixture. A curing agent is generally a salt based product that contains sodium nitrite and a pink dye. I am not inclined to add too much sodium nitrite or dye to my diet, so I just use salt and a little sugar to help cure the meat. This is basically a dry brine. It is your call if you want to add a curing agent. You can easily find one online or at some butcher shops. It is possible to make sausage into patties without the need for any special equipment. For this tutorial we will use a grinder and sausage stuffer to put the meat and spice mixture into casings. Cased sausage smokes very well directly on the smoker racks and retains the fat that is necessary for keeping the sausage moist. You can purchase a countertop appliance that has both grinding and stuffing attachments as options, such as a KitchenAid multi-purpose stand mixer. I inherited a tomato hand grinder that leaves the seeds and skin behind from my grandmother for making sauce. It is an antique and works like a charm because it does not generate any heat. Heat can destroy some of the enzymes in certain foods. If you want to save some money and use a little muscle, try to find a hand grinder. If you do not own one of these high-end machines or a hand grinder, you can purchase already ground meat, or have your butcher grind the meat you desire. Most local butcher shops sell pre-ground meat and fat to combine for sausage making. As well, you can fill casings by hand with the help of a pastry bag. It takes a little skill to do that so the casings are filled solidly without air pockets. I have prepared two fairly basic recipes for home-made sausage that you can smoke. The ingredients are different. The directions are the same. How to actually smoke the sausages follows the recipes. There are no hard rules when it comes to flavor. The only thing that really matters is that you have the correct proportions of meat, fat, salt, and sugar. It is also a good idea to grind meat and fat that is well chilled. For these recipes you will need casings. You can get hog casings from your butcher that are pre-cleaned and salted to remove bacteria. These are the intestines that they remove during the butchering process. If this sounds unappealing, you can order edible, ready to use, collagen casings online. This is what I would call County Sausage. Feel free to get creative with your seasonings and add other elements. For instance, you can use maple sugar in place of the turbinado, add sun dried tomatoes, use dry sherry in place of the water, etc. This recipe is a great alternative for those who don’t eat pork. 1. Place your hog casings in a large bowl with cool water to soak for an hour to remove the salt. Rinse the casings well with cold running water. Allow the water to run inside the casings. If using edible collagen, follow the manufacturer’s packaging instructions for preparing. 2. Grind the meat and fat on a course setting into a large bowl. Or, mix your pre-ground meat products together in a large bowl. Add the salt, sugar, seasonings, and liquid. With a non-latex glove, mix the ingredients well by hand to combine. You can also use a spoon, but your hand works best in my experience. 3. Set up your appliance for stuffing, per the manufacturer’s instructions. Place the open end of the casing over the nozzle. Tie off the other end to close it. Gently push the rest of the casing to cover the nozzle completely. Slowly push the meat mixture into the casing using one hand to help fill the casing and the other to regulate the speed. This may take some practice. You want the casing to be filled but not overstuffed to where it breaks. If a casing breaks, just remove that section and tie off the end. You can reuse the meat in the broken section or make breakfast patties with it. Here is a quick video showing one way to stuff sausage into casings with a stand mixer attachment. 4. Tie off the sausage roll into individual links by twisting the casing every 4 to 6 inches. You can also leave the sausage in a single whole roll. 5. Hang the linked or whole sausage to air dry for 1 to 3 hours in a cool area. You may have to be creative with this. A folding clothes drying rack works great. If you can’t figure out where to hang the sausage, place the roll on paper towels and rotate often so that all surfaces dry. 6. Place some paper towels in the bottom of a storage container large enough to hold all of the sausage. Layer the sausage, then more paper towel, then more sausage until the container is full. Place a top on the container. Put this in the refrigerator and chill for 12 to 24 hours. 1. Allow the dried and chilled sausages to come to room temperature for 20 to 30 minutes. 2. Preheat the smoker to 250°F. Line the drip pan for easy cleanup. Place water in the pan to 1/2 full. Place wood chips in the tray or drawer. 3. You can cut your sausage links at the twisted sections and tie them off. Or, you can smoke the whole roll. 4. Place the sausage links directly on the smoker racks, spacing them at 1/2 inch apart. Or, place the roll so that there is air able to circulate between surfaces. 5. Open the top vent and smoke for 3 hours or until the internal temperature reaches a minimum of 165°F. Replace wood chips and water every 45 to 60 minutes. Are you wondering what to do with all that smoked sausage? It generally gets eaten like a snack right out of the smoker in my home. If you have leftovers, here are a couple of recipes to try. I crave a good New England style chowder in winter. Yankee bean soup is in that category for me. It is often made with a store bought smoked ham hock or two. But, I prefer it with smoked sausage. This gives the soup plenty of flavor and evenly cut pieces of meat in every bite. I will soak my beans overnight and precook them before making the soup. However, I find canned beans to work just fine in this recipe. They are always soft. I buy the organic northern beans at my local grocery store for 99 cents a can. You really can’t beat that. Just rinse and drain them well before using. 1. In a large pot, such as a Dutch oven, melt the butter over medium heat and sweat the onions and garlic until translucent, not brown. This will take from 5 to 10 minutes. 2. Add the tomato paste and allow it to cook for 1 or 2 minutes. Stir in the cider vinegar to thin out the tomato paste. 3. Add the broth and all of the other ingredients. Bring this to a boil and reduce the heat to a low simmer. Cover the pot and cook for approximately 20 minutes until completely heated through. The vegetables should be soft but not mushy. If they are still crunchy, simmer for another 5 to 10 minutes. 4. Serve hot with some small chowder crackers on top or a piece of cornbread on the side. Here is a classic cornbread recipe from The Spruce. Lamb sausage is really special. What I mean by special is that it is sophisticated in both texture and flavor. It plays nicely with spices and herbs and can stand up to the bitterness of wild greens. It also compliments the blank canvas of simple starches. I attribute that to the subtle gaminess of the meat. Most of our lamb is pasture raised, so it has notes of fresh grass, unlike much of our domestic beef that may be fed grains and soy products. Pasta is a great vehicle for showcasing lamb. If you don’t want to mix dairy with meat, use 1 TBS olive oil in place of the butter and omit the cheese. You can also use polenta in place of the pasta. Wild greens are often bitter. If the bitterness is not what you like, substitute with spinach, Swiss chard, or kale. 1. Bring a large pot of water to a boil. Blanch the greens in the boiling water for 2-1/2 minutes. Transfer the greens to a colander using tongs or a spider and rinse them quickly under cold water to stop the cooking. Using your hands, gently press out the excess water from the greens. Cut the drained greens into 1/2-inch pieces while the pasta is cooking. 2. Add 2 teaspoons of salt to the boiling water. Cook the pasta according to the directions on the box, leaving it a bit al dente (approximately 1-1/2 minutes short of suggested cooking time). 3. While the pasta is cooking, heat the oil and butter over medium in a large skillet. Add the garlic and cayenne. Cook for 1 minute. 4. Turn the heat up to medium/high and add the smoked lamb sausage and allow it to crisp and get warm for about 2 minutes. Add the greens to the skillet and stir to combine. 5. Add the pasta using a spider or slotted spoon directly from the pot of water. It is fine to have a little bit of the starchy water mix in with the dish to help form a sauce. Let this come to a simmer for a minute or two. 6. Remove the cooked pasta, greens, and lamb to a large serving bowl or platter and coat with the cheese. You can also drizzle some extra virgin olive oil on top to make the dish glisten. 7. Serve immediately with a side salad of tomatoes, cucumbers, and red onions and some crusty bread. Here is a simple salad recipe from The Food Network. There are so many sausage recipes to try your hand at. There are also numerous varieties of pre-packaged sausages available. Have fun shopping the sausage section of your market to get some ideas, or just pick up one that appeals to you. Cooking time may vary with store bought preparations, as the fat content will differ, especially with chicken and turkey sausage. If you are inclined to make your own sausage, use the basic proportion guidelines in the two recipes described here.